Tacos for breakfast are always good and these ones are filled with spicy Mexican style chorizo, scrambled eggs, refried beans, pico de gallo, queso fresco, sour cream and cilantro. Often times weekday breakfasts are rushed and thus pretty simple so on the weekend I like to do something a little more. As many of my long time readers know, I have a thing for tacos and I was thinking that a scrambled egg taco would be a great way to do something a little special for breakfast this weekend. I formed the base of the breakfast tacos with Mexican chorizo , a fresh pork sausage seasoned with plenty of chilies, which I fried and then added eggs and cooked them scrambled style. The chorizo scrambled eggs (chorizo con huevos) along with the tortillas form the base of the tacos and from there you can add your favourite tacos fillings and this time I went with refried beans , pico de gallo , cheddar cheese, sour cream, cilantro and lime. 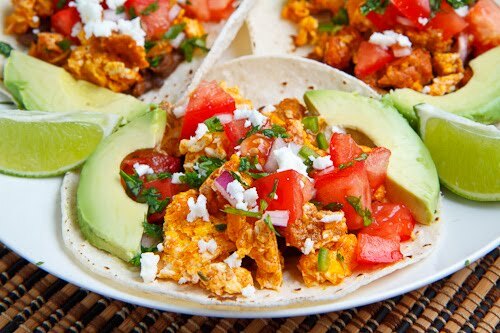 These chorizo scrambled egg tacos are really easy to prepare and they make for a fun and tasty breakfast for the entire family! I like to change things up with the toppings going with whatever I feel like or what is on hand and this time I went with refried beans , pico de gallo , avocado and crumbled queso fresco. Add the sausage, cook breaking it apart as you go, about 7-10 minutes and set aside reserving 1/2 tablespoon of oil and grease in the pan. Add the onion to the pan and saute until tender, about 5-7 minutes. Add the sausage and eggs, season with salt and pepper and cook until the eggs have almost set, about 1-3 minutes. 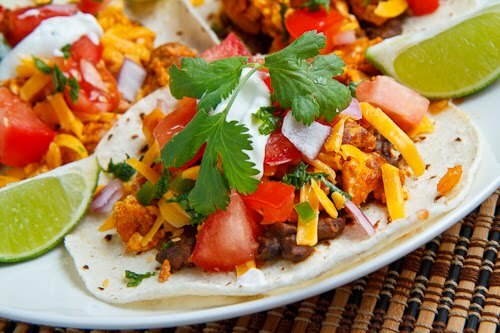 Serve on tortillas and refried beans topped with pico de gallo, queso fresco sour cream and cilantro. 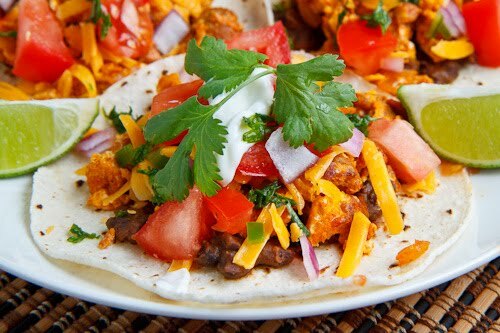 its funny that you posted this recipe I was thinking about Breakfast tacos this morning! I will be trying this out at our family breakfast in the morning !!! OH YUM! This is right up my alley, and looks like tomorrow's breakfast! Thanks, Kevin! i love savory and spice for breakfast. Ohh this looks delish for breakfast. yummy these look so tasty! Wow. Just wow. Chorizo + tacos + breakfast?!? I am dying a little inside at the incredibleness of this combination. This looks amazing, can't wait to try it! Man does this look good … now it I just had some chorizo on hand, I'd have myself a great Sunday breakfast. And that's for breakfast?? WOW! Looks amazing! Would like to try that. That certainly outshines the breakfast taco I had today… bacon strips, sautéed onion, shredded LF Mexican cheese and Greek yogurt. Your photos are always so gorgeous and I want what you had! You definitely succeeded in doing something special for breakfast! The flavors in this are fantastic. Savory for breakfast is kind of my thing and I love the idea of breakfast tacos! These sound like they have all my favorite burrito flavors…plus eggs! These look great! I agree, tacos for breakfast are always a good idea! Especially when they're filled with Chorizo! A real breakfast treat! Packed with flavors…Thanks for sharing. I really need to keep chorizo on hand more often! These are making my mouth water. I love interesting breakfast foods like this. Beautiful and sounds awesome. But how do you remain so slim with all your great cooking?